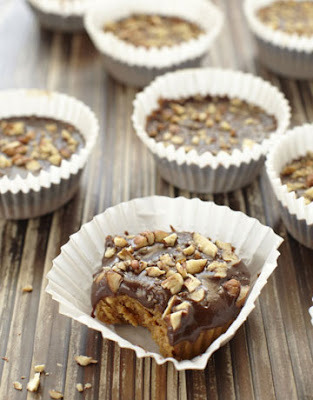 My friend Marly made these Vegan Chocolate Peanut Butter Cups from Alicia Silverstone's vegan cookbook The Kind Diet. They were surprisingly good (I wasn't sure what to expect with a vegan dessert), super rich, and something I'd love to eat whether it was vegan or not. Whether you're leaning into a vegan diet or a just craving that old classic combo of peanut butter and chocolate, here's a delicious treat to satisfy your craving. I can't wait to make them. Read more about her cookbook from The Daily Green. Melt butter in saucepan over medium heat. Stir in peanut butter, Graham cracker crumbs, and maple sugar and mix well. Remove from heat. Even divide mixture into muffin cups. Combine the chocolate and milk in another pan. Stir over medium heat until chocolate melts. Spoon chocolate over peanut butter mixture. Top with chopped nuts. Place in fridge for at least 2 hours before serving. If I could buy one type of shoe for the rest of my life, I would buy wedges. They're so versatile. You can wear them with jeans, dresses, skirts, and shorts. I love them. 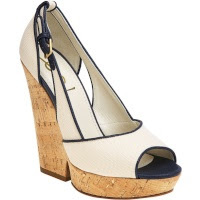 And for spring, I'm really loving this YSL Tweed Platform Wedge. If I could walk in these (they're pretty darn steep), I might sell my first born for a pair (kidding of course, well, maybe). They have a beautiful silhouette and are wedge perfection. Gwyneth Paltrow was my favorite look of the night. Flawless. 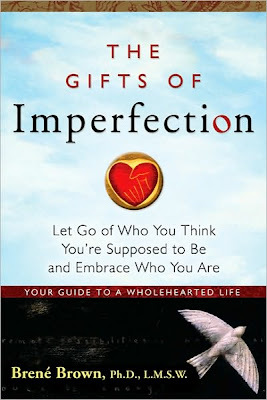 My friend Marly recommended the book The Gifts of Imperfection: Let Go of Who You Think You're Supposed to Be and Embrace Who You Are. She raved about it and had so many interesting things to share that I bought it immediately. I'm so glad I did. It's a life changer. I don't think the title does it justice though. It's not a book for perfectionists. It's a book for everyone. I can't stop talking about it (neither can Marly) and just bought six copies to give to friends and family. It is so inspiring and really opens your eyes to yourself and your relationships. It's allowed me to change the way I look at shame, vulnerability, joy, happiness, compassion, courage, and connection. I cannot say enough wonderful things about this book and how it has already affected my life in such a positive way. It's a great book to read on your own or introduce to your book club. I think anyone who reads this blog is a candidate for reading this book. It's a must! I'm always trying to think of ways to make tasty dinners out of leftovers or odds and ends in the fridge. Anytime I make white rice now, I make extra to use for fried rice because it's a quick meal and an easy way to clean out the fridge. All you really need for fried rice is white rice, eggs, and soy sauce. From there, anything goes. I thought I would share some of the many things you can use to make fried rice so next time you make rice, you'll make a little extra. I make it different every time so I'm hesitant to write out a recipe, but I promised my friend Courtney I'd post it so here's a very rough version of what I do. Heat 1 T butter in a saute pan over medium heat. Add mushrooms and let cook. Once sauted, remove from pan and set aside. Add 1 T oil and more butter to pan. Bring to heat and add shallots, carrot and ginger. Saute for a few minutes, then add garlic and saute for a few more minutes, until everything is cooked (be careful not to burn though). Stir in broccoli and green onion (if using now versus at the end), then increase heat to medium-high, maybe add a bit more butter and mix in scrambled eggs. Stir to combine and move eggs around until scrambled. Reduce heat to low and add tofu. Season with pepper and a few drops of sesame oil. In a large saute pan, combine 1-2 T canola oil over medium-high heat. Add rice and break up with a wooden spoon, continuing to stir until it's heated. Reduce heat to medium-low and stir in 2-4 T butter and lots of soy sauce. (I add a little bit of each at a time until I get the right look and taste. Obviously the more butter and soy you use, the better it will taste.) Then add egg/tofu mixture and stir to combine. Lower heat and let flavors meld. When almost ready to serve, melt some butter in the small saute pan and cook one egg per person until cooked "over-medium". 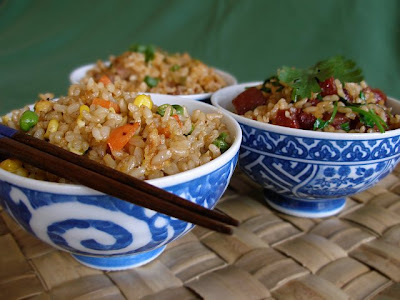 Spoon fried rice into a bowl, sprinkle with toasted sesame seeds, top with the egg and then sprinkle with a little pepper and splash of soy sauce. Serve with chopsticks and Sriracha for those who like it. Again, this is a really rough recipe because I never measure or do it the same way twice. It's hard to mess up though if you use good fresh ingredients, eggs, butter and soy sauce. Delish! My husband and I are crazy about pizza take-out from The Independent Pizzeria in Madison Park. We get it to go every week or two on the weekend when I need a break from cooking. There are lots of great pizzas to try. Our favorites right now are the Beta, the Stevedore, and last night I was really loving the Quattro Formaggi special (we added prosciutto - YUM!). They also make a good caesar salad. While it's not my favorite pizza in town - that award goes to Delancey - I would say it's a very close second. And considering we can no longer take the kiddos out to dinner, The Independent Pizzeria take-out has been a life saver when we're jonesing for some good pizza. Calling All Cooks: Help A Sister Out with Recipe Ideas! 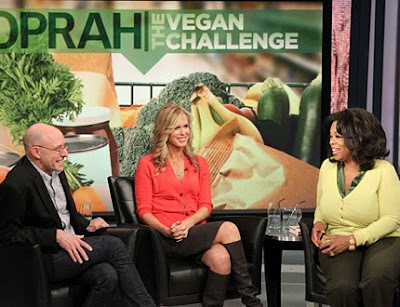 In case you didn't see the Oprah with Michael Pollan and Vegan & Lifestyle author Kathy Freston, there are lots of links on Oprah.com with info from the episode. It was a really interesting special on food, meat manufacturing in America, the vegan diet and more. 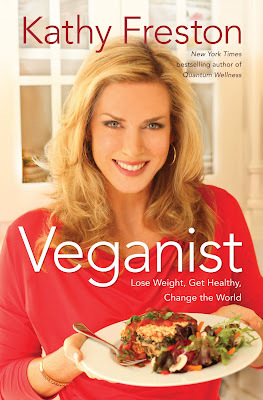 My friend Marly just read Kathy's book Veganist: Lose Weight, Get Healthy, Change the World and is really inspired to lean (heavily) into a vegan diet. While I'm not ready to read the book because I can't think of giving up all meat and dairy at this point in my life, I am inspired (by the show and what Marly has told me) to lean into it a little. For me this would mean maybe having a "Vegan Night" once a week, or at a minimum, being more mindful of how much meat and dairy we consume on a daily basis and cutting some out wherever I can. So, leaning into this means I have to plan ahead with some more vegetarian and vegan recipes. I've shared recipes with you, now I'm begging you to share with me. What's your favorite vegetarian or vegan meal (breakfast, lunch or dinner)? Please post your favorites or email me directly. I'll keep you posted on what I make and love so you too can lighten up your meat and dairy consumption. Once again Michael Pollan inspires me. I like the idea of meat flavoring a main course (like soups and stews) versus a big hunk of meat being the main course. I always tend to like soups and pastas with some meat better than a big chicken breast or pork chop anyway so I'm going to think more about this as I plan future meal plans. 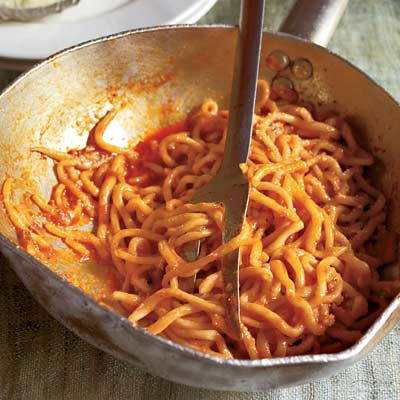 I pulled this recipe for Pasta all'Amatriciana from Food & Wine magazine and just made it last night. I was actually shocked at how good it was. I even said to my husband at one point "Honey, close your eyes, doesn't it taste like you're in Italy?!" It was really really good and I will definitely make it again. I used Applegate pancetta (which I diced), bucatini noodles (from PFI), and San Marzano brand whole tomatoes. My friend Ali tweeted this restaurant review for Uneeda Burger. Love the review. Can't wait to try the restaurant. "Uneeda Eat This Immediately (If Not Sooner)"
My friend Jennie just launched her blog House Crush. I've had a crush on it since she gave me a sneak peak and now everyone's going to have a house crush because she just went live. 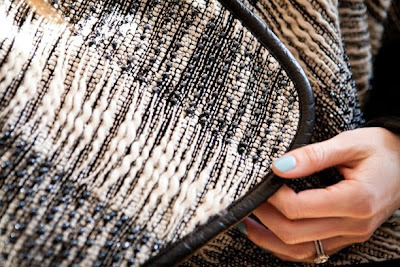 Jennie has an amazing eye for design and the details - color, pattern, texture, finishing touches and more. You should see her home!!!! It's A-mazing! If you love home decor like I do, check out her blog and add it to your daily stops. I already have a crush on every photo she's shown. I just love her style and can't wait to see what else she has in store to inspire us. 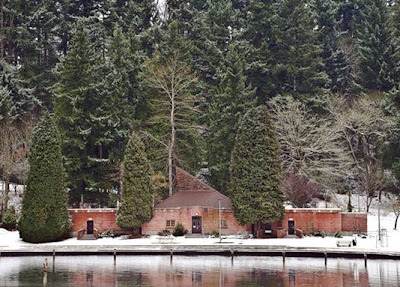 I had to share this photo my uncle took at Seward Park after our big snowfall in November. I love it. I love this city! I'm a jeans and t-shirt kind of gal. I try to spice up my uniform with shoes, cardigans and jewelry, but my starting point is pretty much always a pair of jeans and my latest t-shirt obsession. Lately I've been cycling through a few Madewell v-neck pocket tees in white and grey. There's usually one on my body and one in the wash at all times. They are perfect in every way... soft, not too thin, good neck-line, and they don't shrink up to a size 4T when washed. I just discovered Madewell's more textured tribute tee before my vacation and am now obsessed with them. They come in great colors (I especially love the red hibiscus and pale sea) and have a great fit - a little oversized and boxy which I like when wearing with short shorts or leggings. A perfect t-shirt for spring and summer. I'm an Amazon junkie. I love, love, looooooove it. I buy everything from diapers to books to art supplies, and pretty much every Christmas gift I bought my kids this year was an Amazon purchase. In theory, I'd probably rather support local mom & pop shops for books and toys, but with a 1.5 year old and a 3.5 year old, I'll cut myself some slack for choosing the cheaper and easier option for a few chaotic, expensive, never-ending-diapers kind of years. My big complaint about Amazon, however, is the boxes. I love getting my deliveries but always feel badly about the boxes and all the waste. Between Christmas gifts and diapers, I'm never proud of how much recycling we have. Well kudos to Amazon for knowing their customers. 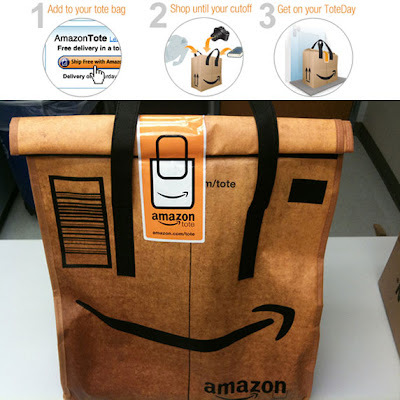 They've invented Amazon Tote. AmazonTote is a free weekly delivery service from Amazon.com. There are no subscriptions, minimum delivery sizes, or fees. Items delivered using AmazonTote will be brought to your doorstep in a reusable tote bag, free of charge. My friend Erika told me about it and within minutes of her leaving my house I was online looking into it. What's not to love?! If you are an Amazonaholic like me, check it out! And if you buy your diapers through Amazon, sign up for Amazon Mom and get a free Amazon Prime account (free 2-day shipping on pretty much everything plus other benefits!). Amazon Prime is great for Amazon junkies. "At Marc Jacobs, the Show Before the Show"
While on vacation my son was battling a cold and in the midst of getting two more chompers. And the kid has some serious chompers (look past the messy face and straight at those pearly whites, then imagine two more piercing through the gums on the outer edges... pure torture for the little buddy). 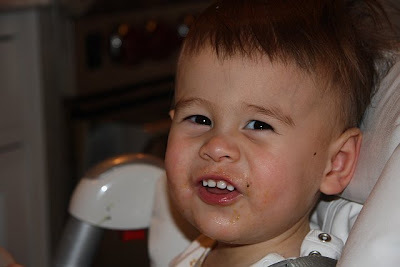 So while nursing his ailments he decided to give up on food and only consume milk and french fries. I'm not proud of the 11 day french fry throw-down but I was on vacation and it's all he would eat. Not a battle I was willing to fight. So our first day home I couldn't take it anymore. I needed him to eat, and I wasn't willing to give him crap just for calories. So how to get good calories in a feisty little guy when he's on a food strike? I figured I could muster up enough ingredients between our empty fridge and packed freezer to make a relatively healthy smoothie that would also taste good. It ended up tasting SO good that both kids chugged it. I made them again this morning to similar results - empty glasses and smoothie-staches. Hubby and I enjoyed them too. Delicious! I'm baaaaaaack! Did ya miss me? Sorry I left without a goodbye. I was quite sick and then headed off to Hawaii for our family vacation. I made myself unplug while on vacation and boy did it feel good. I'm back though and have lots of fun new things to write about. 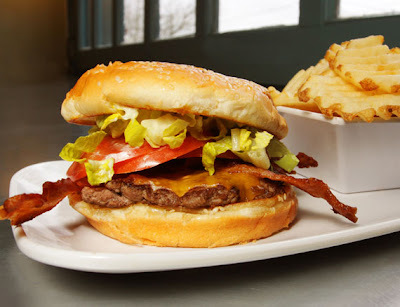 First off is my obsession with a few new Seattle eateries. My friend Tara introduced me to Seattle's new wood-fired bagel cafe Eltana. My husband and I loved it, so much so that I ordered up a bag of bagels and smear to go for our flight the next day. I hate flying but knowing I had a delicious toasted bagel with red pepper and walnut spread waiting for me got my mind off the possibility of the plane making a nose dive into the Pacific. Thank you little wood-fired bagel you! My husband loved it too. He got his bagel with spicy garlic cream spread and it was also delicious. I'm also loving Eastlake's Nettletown. I went for lunch and ate enough to feed a small village. The servings are quite large and I just couldn't stop. The spinach salad was good, the fried rice was great but the winner was the Nettletown noodle dish with pork topped with seasoned wild mushrooms, tea egg, scallions & toasted garlic oil. I also loved their refreshing ginger drink, so much that on my way out I asked what was in it. I woke up craving it so within hours I had one in my hand. Not sure what measurements they do, but I did equal parts of each and it was pretty darn good. I've been sick for days. Like really sick for too many days. My friend Whitney brought me some Ed Fretwell Soup from Molly Wizenberg's A Homemade Life cookbook. It was deeeeeeeeeeeeee-licious. It's kind of your basic hearty veggie/bean soup but there was something a little different about it. I can't put my finger on it. Maybe it just tasted better than others because someone brought it to me when I was sick, and I was so touched. Maybe it was the glug of olive oil she instructed me to pour on top along with salt, pepper and parmesan. Whatever it was, it was delicious and a soup now added to my MAKE list. The recipe, available here on her blog, is a little different than the one in her book. Whitney made the version from the book, so I recommend that one. But if you don't have the book, by all means, give the online version a go. Dieting? Do You Eat Breakfast? Drowning is the second leading cause of death (after motor vehicle crashes) in children 12 and younger in the US. Michael Pollan is on Oprah today. Should be interesting. Catch it if you can.